Staff Sgt. 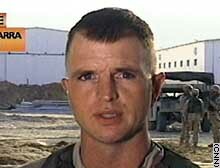 Bruce Jones describes being in middle of firefight in Samarra. CNN's Nic Robertson on the weekend killings. CNN's Suzanne Malveaux on debate about President Bush's trip to Iraq. (CNN) -- U.S. forces responded Sunday to simultaneous ambushes on convoys in northern Iraq with heavy firepower, killing at least 46 attackers, according to military officials. No Americans were killed in the gunfights, which took place in Samarra, about 75 miles north of Baghdad. Staff Sgt. Bruce Jones described the intense battle Monday from Samarra to CNN anchor Soledad O'Brien. We escorted them in. As soon as we got to that location, we started receiving direct fire via small arms, AK-47s. My guys from both the east and the west bank started returning fire back to the point of origin and neutralizing any targets they'd actually seen. During the course of the firefight, we started receiving not only small-arms [fire]. We had incoming and direct fire from mortars. We also had RPGs coming through here just hitting us all around. O'BRIEN: Give me a sense of how long this firefight lasted and what kind of firepower U.S. troops used to return fire. JONES: [M]y understanding is it was only supposed to take us about 30 minutes in the actual Iraqi currency exchange, to drop off the money. And I estimated that about an hour and a half, two hours, is what I would just estimate. The firepower that the U.S. had, as far as we had some tanks out there. We had some Bradleys. I had an MP squad with me and I had another one at the other bank. We were using 40-millimeter machine guns. We were also using our regular M-4 rifles and 249 SAWs plus some 50-caliber machine guns. O'BRIEN: Tell me a little bit about any civilians. I heard and read that there was a barricade blocking off the streets. Did it seem to you that there were no civilians around? Did that seem surprising to you? JONES: Well, what they attempted to do -- and we don't know if it's actually civilians. I called them all terrorists. If they're blocking the streets or if they're attempting to block the streets, then obviously they're not a civilian. They're some sort of combatant. They're helping out the terrorist projects with that. I'm a true believer of that. These guys were trying to throw vehicles in the way, taxi cabs, a couple of white pickup trucks and everything, to actually block the roads as we tried to egress out with the convoy. We did have to -- we did have to ram some vehicles out of the way to get our people out, to get our people out of there safely and securely. But civilians in the area, you know something's going to happen as soon as you get in there and all the civilians basically clear out of the way. So if you go into a street or part of the city that's normally busy and there's nobody around, you'd better get your guns up and ready to go. O'BRIEN: Before I let you go -- I know you said you spoke to your wife yesterday. You've got a 10-month-old son. While we've got you up on the satellite, anything you want to say to them? JONES: Yes. Mercedes, Nicholas, they're -- they're my heart and my soul right now. What I'm doing over here, I'm doing to protect the freedom and the future freedom of my son. And, you know, they're my driving force behind everything that I do.